very insightful indeed... see below the post for this weeks video. I had a quilt to hand bind so I brought it with me to my doctor’s appointment so I could busy myself with something productive while I waited. This, of course, perpetuated the usual interest when someone sees me working on a quilt. The front office women could not have looked more than 12 years old and when they viewed my quilt, thought I was this creative goddess that walked on water simply because I knew how to thread a needle. One woman asked me if learned to do what I do from my grandmother, I guess equating the essence of “time” and “quilting” to a couple of generations in the past. I mean my mom could have taught me and not necessarily my grandma. After I got home I set myself the task to write up my creative genogram. I love genograms; I learned all about them in my counselling classes and actually took just a class where it dealt only in the design and development of a genogram. A genogram is a blueprint of your life. There are symbols and a meaning given to the symbols which represent significant variables in your life. So on the genogram, your history is represented by births, deaths, illness, relationships, financial variables and then lines are drawn which also constitutes their own meanings. For instance: I have a sister so on my genogram you would see me and my sister with this zigzag line drawn between the both of us which means our relationship is fused and dysfunctional because we both go on each other’s last nerve. If we had a healthy relationship, then the line would be a straight line. Genograms are a great gift to give to a couple prior to their marriage so that they can see each other blueprints and take a more proactive stance regarding potential problems. I did a genogram for Mark and I and looking at our blueprints and knowing what I know now, I think I would have waited to marry Mark. Mark’s side of his family has a lot of addiction issues which can really zap you into a vortex of dysfunction if you aren’t prepared. I was not. But that's another story over coffee or whiskey…. This afternoon I created my genogram to try and see how I got to where I am today. I plotted all my family, three generations worth, made a couple of calls to surviving relatives to both sides of my family; speaking french both from memory and throwing in some English and came up with nothing. Lord, I thought someone out there must have done some quilting or sewing….played a musical instrument…anything. I have the most uncreative family. Granted, everyone was well educated but come on…… Anything having to do with art, sewing or quilting you will not find in my genogram. However I am giving creative license to my grandpa who was a kosher butcher so slicing and dicing with precision is kinda like using a rotary cutter on a piece of fabric. So instead of cutting up a piece of Cotton and Steele fabric, he cut up corn beef. What is interesting about my family though is my generation of my siblings. Actually my brother and I. My brother has this amazing eye for color and design- he doesn’t engage in any of that professionally but he and his wife redecorated their townhouse and my brother did most of the choosing of colors. Even though Mark is not biologically related, that guy can draw and I let him pick out all of our new furniture since I did it the last time and he made some awesome choices - coordinating color and fabrics. And of course there is my love for fabric and what I can do with it. And once again, the creative bug has kinda sorta skipped a generation. Sophie is not into sewing or quilting but she has inherited her father and my brother’s sense of color and style. She decorated her apartment herself and it is very sophisticated. Her cousins on my side of the family, all boys are not into any of the arts. One is a college professor, one is a lawyer, on is going on to graduate school in statistics, one is a marketing executive. Of course this dialogue can continue into whether creativity is learned or inherited. I started sewing/quilting when Sophie was 2 and so for most of her life she was surrounded by creativity. However, she never showed any interest in the sewing machine or the fabric. Show and Tell Monday, June 25th : Tell us about your creative genogram. 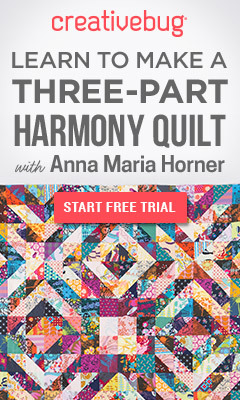 Is there a family history of sewing or quilting or is your interest based on happenstance? Do you believe that creativity is inherited or learned?